For the introductory notes on the Ruperra Conservation area, see the Ruperra web page. This page attempts to describe some of the geological features of each of the three exposures on the RIGS site. 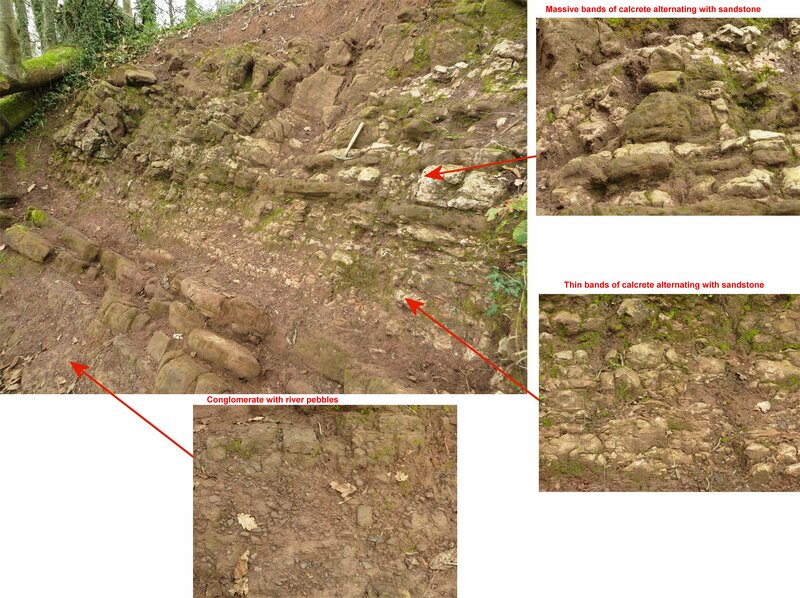 A provisional summary has been compiled by John Davies, although in the meantime furthr excavations have proven that the section described as “Slump folded alternating limestones and mudstones” has proven to be illusive. Copies can be found here, either in ODT format or in PDF format. The site is positioned towards the south-facing escarpment of the Ruperra Conservation Trust area, position indicated on the map below. 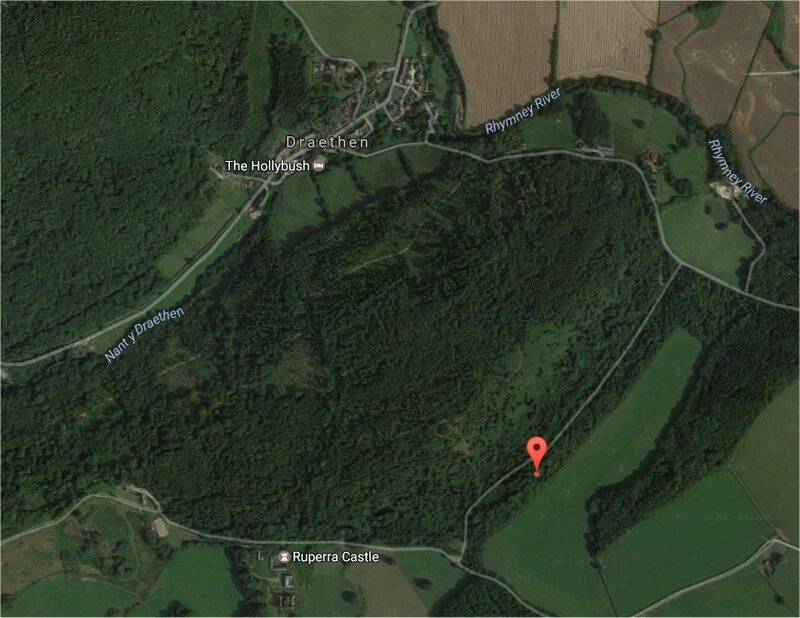 Approximate position of the Ruperra RIGS site in relation to Draethen and Ruperra Castle. 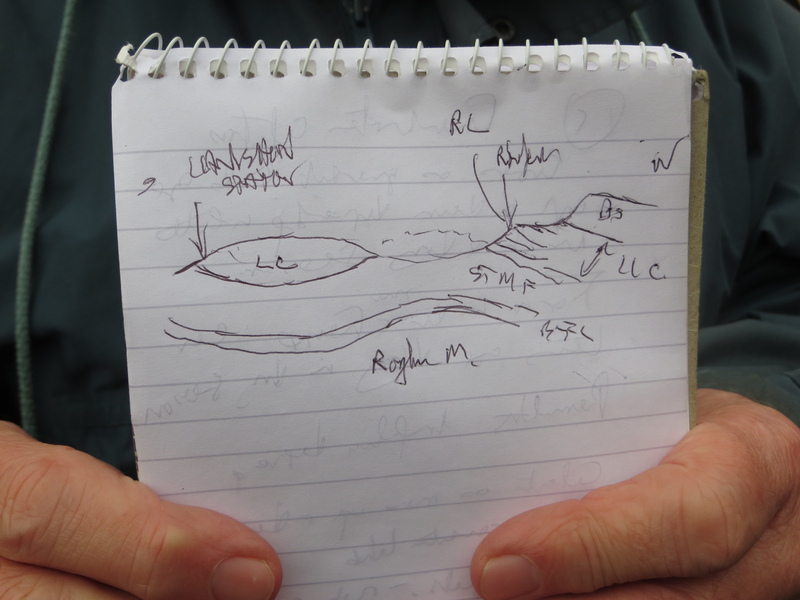 Since the Ruperra site is believed to represent the same horizon as the Llanishen conglomerate type section at Llanishen station, a sketch by John Davies indicates how the two correlate as being part of a double anticline. Diagram by John Davies, showing the position of Ruperra site versus the type section of the Llanishen conglomerate at Llanishen station. The main feature of the first exposure is the fact that a fault separates a well-stratified section to its right, and more jumbled up mass to its left. This could represent different portions of a river bed, and the calcrete is thought to represent the fluvial type on both sides. 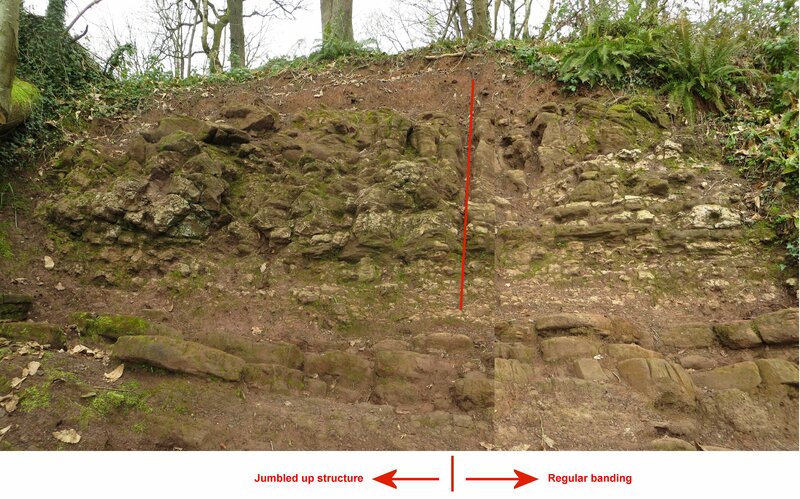 Fault separating a regular sedimentation on the right and a jumbled mass of calcrete and sandstone on the left. The three distinct layers of sedimentation of exposure no.1. An exploratory cut has been made in this section. However, because of concerns from the Ruperra Conservation Trust, this exposure has as yet not been developed any further. This is thought to represent a pedogenic or palustrine calcrete, which may have deformed when it was still semi-plastic. Some of the internal structures of the calcrete seem to indicate the influence of plant roots. Structures in the calcrete of exposure no.3, possibly indicating the influence of roots in the formation of a pedogenic calcrete. 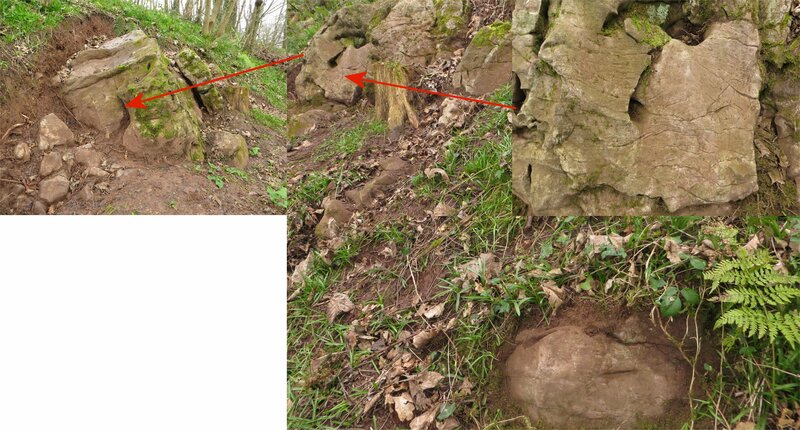 The fourth exposure consists of a limestone block showing a finer structure possibly highlighted by water action. 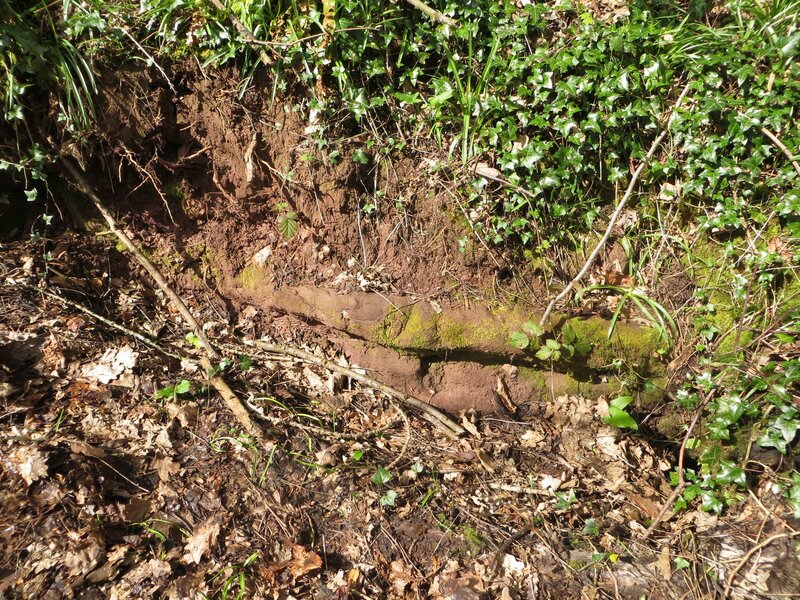 Underneath this block lies a fairly continuous layer of sandstone. Exposure 4 represents a limestone block sitting atop a sandstone bank (bottom right). 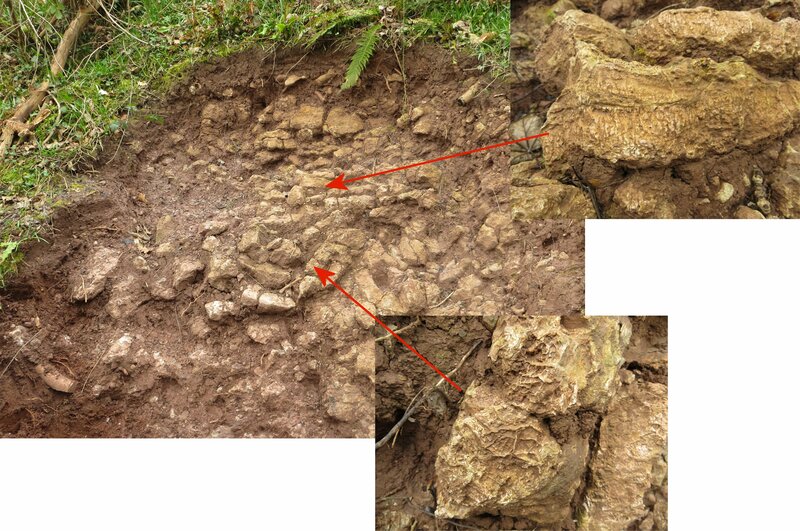 Once cleared, the fine structure in the limestone becomes more obvious. For the moment it is unclear how the four sections correlate with one another. The surprising aspect of the site is the diversity of sedimentation and calcrete formation in each of the three exposures. For the time being all identifications are highly provisional, and further expert opinion may well change the notions set out on this page.